Pendant and hanging outdoor lights add beauty and depth to the facade of your home. 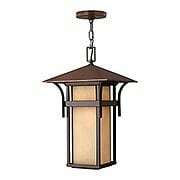 Ideal for a stately entrance, a vaulted porch, or covered outdoor living area, they cast a broad and even light. Choose from hundreds of styles, sizes, and LED options. The Regal pendant greets you with grand, old-world style. Stamped details are highlighted by a black granite finish, while clear seedy watery glass creates a romantic glow. Crafted from durable, weather-resistant cast aluminum, it is perfect for your patio or porch. 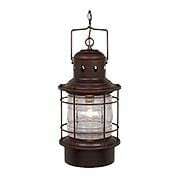 Like the island for which it is named, the Nantucket hanging lantern possesses a simple and rugged beauty. 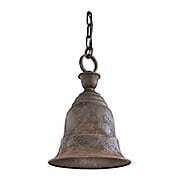 Hand made from solid brass, it's aged and distressed to replicate the weathering forces of nature. Panels of rough & seedy glass enhance the authentic colonial character. A fusion of chic styles make the Porter Exterior Pendant a standout design. This robust fixture is made of rust-resistant aluminum and comes complete with a vintage filament bulb. Merging modern farmhouse, industrial, and Arts and Crafts elements, its fine rivet details and sturdy hanger lop create a distinctive statement. The Lincoln pendant defines classic Colonial style. Featuring a weather-resistant cast aluminum frame, clear seedy glass panels, and hinged doors, it offers historic flavor to any traditional exterior. 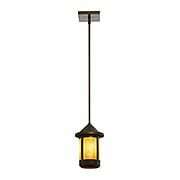 This damp-rated fixture comes in a rich bronze finish. Stately, streamlined and completely cosmopolitan - the Randolph Collection is a fine example of "urban classicism". 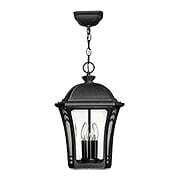 Crafted from cast aluminum, each piece is crisply detailed, with striking oval mullions and a shallow pyramid cap. 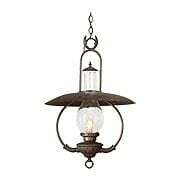 The Rue De Royal Extra-Large Hanging Lantern gives you the historic look of gas lighting without the requirement of a propane feed. Inspired by the charming residential lanterns of Charleston and New Orleans, these authentic fixtures are crafted from solid copper, hand-riveted and antiqued. Beautifully designed and detailed, it features a glass roof with chimney, aged copper candle covers, and a hinged side panel (for easy access to the light bulbs). 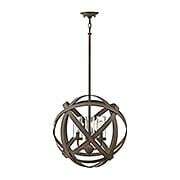 Crafted with hand-forged iron and featuring an Old-Bronze finish, the La-Grange 20-Inch Pendant has timeless Colonial appeal. For use indoors or out. A little bit New England, a little bit Mission - this Freeport Hanging Exterior Entry Light has a wonderfully eclectic charm. 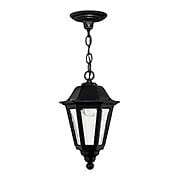 Made of durable cast aluminum, it comes in variety of weathered finishes and glass options, as well as your choice of standard incandescent or LED lamping options. Nostalgic and versatile, it's the perfect choice for a colonial, craftsman or cottage style home. 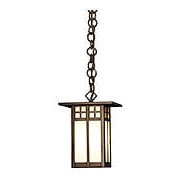 The Manhattan Outdoor Pendant Light's unique bracketed design recalls Mission furniture of the early 20th century. 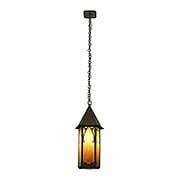 Crisp and angular, with an olde bronze finish, it's the perfect lighting accent for Arts and Crafts style homes. Cast from durable, weather-resistant aluminum, with etched, seedy glass and your choice of standard incandescent or eco-friendly LED lamping options. 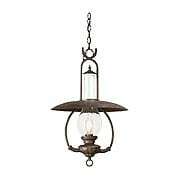 Reminiscent of grand old train stations of the past, the Hyannis 10-Inch Outdoor Pendant brings Colonial flavor to your decor. For added authenticity, the shade is fashioned after vintage-glass insulators of the mid-1800s. Choose from a smooth bronze or textured-black finish. Brass rivets provide both structural integrity and decorative detail in these fixtures inspired by the works of Dirk Van Erp and Gustav Stickley. The bold peaked roof of this series provides a beautiful accent to Craftsman, Tudor and contemporary architecture. Hand made in the USA of solid brass and art glass. 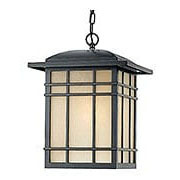 Lantern measures 8 5/8" tall by 5 5/8" wide and is available with two glass color options. UL wet rated for exterior use. Dignified, proportioned and timeless in style, the Manor House series is Colonial Revival lighting at its best. 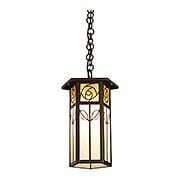 With it's shapely profile and sparkling beveled glass, this simple hanging lantern strikes the perfect period note. Made of weather-resistant cast aluminum. Make a bold statement with this rustic chain pendant. 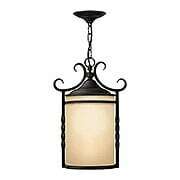 With its steep roof and artistic filigree frame this hanging light harkens back to medieval times. Hand made in the USA of solid brass and art glass. Lantern measures 24 1/2" tall by 10" wide. UL damp rated for covered exteriors. 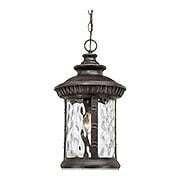 With its curled and twisted metal frame, thick amber glass shade, and distressed black finish, this rustic porch lantern exudes Old World charm. Hanging above your front door, it creates a warm and romantic atmosphere. How perfect for a Spanish colonial, Tudor, or other European style of home! 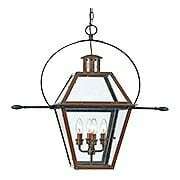 Inspired by traditional style lanterns, the Monte Grande collection brings a sense of Old New England character. 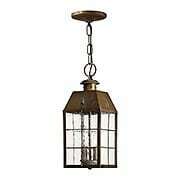 This hanging lantern features a pale cream seedy glass, drip candle covers, and a smooth English-bronze finish. A rust-resistant powder coating makes it ideal for your patio or porch. Shelter's minimalist design is chic and dramatic, a great choice for any modern home. This pendant is constructed of weather-resistant aluminum and features a top light that shines through its cylindrical seedy-glass shade. Choose from LED and incandescent lighting options. The Burton Collection welcomes you home in traditional style. 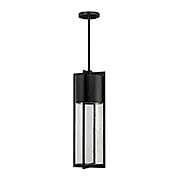 Constructed of weather-resistant aluminum, the robust, black finish of this exterior pendant is complemented by simple, yet elegant features. Distressed copper accents including the candle sticks, roof, and socket cover complete the look. Crafted with hand-forged iron and featuring an Old-Bronze finish, the La-Grange 16-Inch Pendant has timeless Colonial appeal. For use indoors or out. The Carson Medium Exterior Pendant pairs industrial style with repurposed craftsmanship. Bold, overlapping metal ribbons converge to create a rustic handcrafted sphere suspended from an aged rope column. 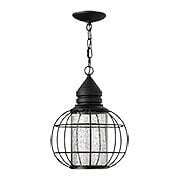 Unique and versatile, this pendant is a ideal for a variety of spaces, indoors or out. Inspired by a classic American lighthouse, the Harbor Exterior Pendant beckons guests to your home. Made of solid brass and aluminum, it comes in an array of finish options. 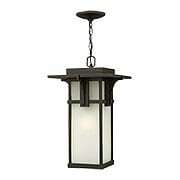 Damp location rated, it is a great way to light your porch or other covered exterior areas. Bold and geometric, with a hint of Asian influence, the Hillcrest Hanging Lantern recalls the dynamic lighting designs of Frank Lloyd Wright. With its distressed bronze patina and opaque linen glass, this classic Prairie School fixture is a warm and welcoming accent to your entry! The Wabash Collection recalls the stylized and streamlined classicism of the 1930s. Traditional, but not tired, it's at home in formal as well as more modern settings. 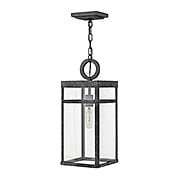 Crafted from durable and weather-resistant cast aluminum, with a blend of clear beveled and etched glass panels. Offered in a museum black finish and two lamping options - standard incandescent and an integrated LED engine. Harkening back to Spanish mission bells of the late 18th-century, the Liberty Medium Exterior Pendant evokes images of Old California. This simple design is made of durable, weather-resistant aluminum, and features a rust finish for an authentic, aged look. 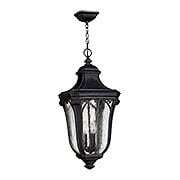 It is the perfect addition to any Mediterranean or Spanish Colonial-style home. 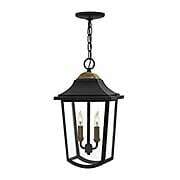 The Fort Quinn 4-Light Outdoor Pendant offers a sophisticated take on French-country style. 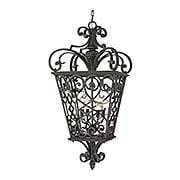 Reminiscent of the iron details seen in the most beloved areas of New Orleans, this historic design is made of cast aluminum. Bringing historic flair, it emits a warm glow for welcoming visitors to your doorstep. 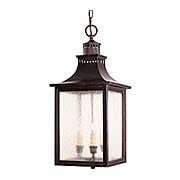 The New Castle is a fresh interpretation of the classic colonial "onion" lantern. Instead of a squashed ball shade, it features a cylinder of clear seedy glass, brilliantly lit with a compact halogen bulb. 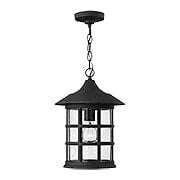 The cage and frame are sturdy, weather resistant aluminum, coated with a durable matte black finish. Nostalgic, yet new, it's a great way to update a vintage colonial home! 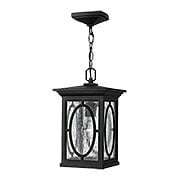 This classic English-style Trafalgar Hanging Exterior Lantern is a distinguished addition to your home. Based on designs from the late 19th century, it is handsomely appointed and perfectly proportioned. Crafted from durable, weather resistant cast-aluminum, it comes with clear seedy glass. Offered in two vintage-looking finish options - museum black and mocha bronze. Bold and geometric, with a hint of Asian influence, the Hillcrest collection recalls the dynamic lighting designs of Frank Lloyd Wright. With its distressed bronze patina and opaque linen glass, this large Prairie School lantern is a warm and welcoming accent to your entry! The Chimera Hanging Outdoor Light's old-world look, inspired by antique lanterns from France and Germany, is ideal for homes with a European flair. The rather formal design is infused with rustic charm, highlighted by the distressed-bronze finish. 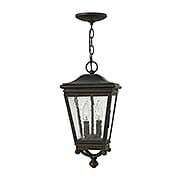 Fitted with clear watery glass, it creates romantic lighting effect, perfect for your porch or patio. Inspired by the designs of C.R. Mackintosh, these Japanese influenced fixtures are at once contemporary, yet traditional. Hand made in the USA of solid brass and art glass. 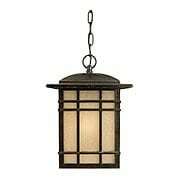 Lantern measures 8 5/8" tall by 6" wide and is available with two glass color options. UL damp rated for covered exteriors.